It’s time to dive in! Inside these made-for-you pages of this #1 bestselling vegan cookbook are 500 super delicious vegan recipes for breakfast, lunch, dinner, dessert and even smoothies. Through this cookbook you’ll find out about the endless variety of options available to you as a vegan. You will get to know that vegan and yumminess are not mutually exclusive. 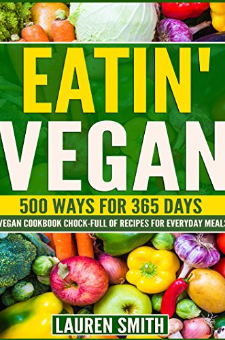 For example, muffins, quesadillas, scones, spreads, soups, pudding, brittle, bars and cupcake recipes abound in this vegan cookbook! There are a multitude of benefits to practicing a vegan lifestyle, and yours could be anything from your desire to live cleaner and healthier to your decision to safeguard the environment through your choices, or because it represents an ethical choice that you feel aligns with your value system. Whatever your reason, with this book, you won’t be bored anytime soon, nor will you suffer lack as you enjoy the food items and drinks presented to you here. So what are you waiting for? Scroll up, click the buy button on this page, open the pages of your cookbook and enjoy!